When we think of the words ‘cute’ and ‘adorable’, our minds likely flash to images of babies and small fuzzy animals. When we think of grandparents, we think of amazing home cooked food and presents, but also hearing difficulties, forgetfulness, clumsiness and many other aspects of old age. However, with old age comes a lifetime of humor and novelty. 1. They have a unique sense of humor. It is no secret that grandparents can be a lot more fun to hang out with than your actual parents, however this is one cute and hilarious way to remember that. Their sense of humor often leaves you giggling all the way home. It is not unlike grandparents to think outside the box. And really, most of the time, it’s worth it and extremely adorable. 3. They are a force to be reckoned with. They might be old, but they are still a force to be reckoned with. Honestly, you wouldn’t want to be up against this guy. 4. They know their limits. You’re their grandchild. Of course they love you…but not that much. They know exactly what their limits are when it comes to spoiling you. So go bother your parents instead. 5. They don’t really understand your jokes. You might have to explain tech talk every once in a while. They aren’t ignorant, however words like ‘cookies’ meant something entirely different back in the day. 6. They know how to think outside the box. This is not the general way to open a Gatorade, however your grandparents’ weird and wacky antics can leave any dull day just a little bit brighter. 7. They are forever classy. Their generation was classy, and some things never change. No matter how old they are, they sure know how to dress! 8. They are smarter than you think. Don’t assume that you know better than your grandparents. When they hear you bragging, they initiate that smug “oh please…” laugh-over-the-shoulder. 9. They can do whatever you can. No matter how old they are or how young you are, they can surprise you with their idea of fun. You might have more in common than you realize. 10. They like to torture you online. They can be as evil as any young person out there. Kids with grandparents on social media better watch out! 11. They don’t get technology and they don’t even care. They need major help with technology sometimes, but when their technology misadventures are this hilarious, maybe you should just leave them the way they are. 12. They can create their own amusement. Lonely day? No worries! Grandparents don’t need other people to make a party. 13. They know their marriage is special. People who have been married a long time have a brilliant sense of humor. You know you’ve reached a milestone in your marriage when you can crack these kinds of jokes. 14. They can make fun of themselves. They’ve lived out the best years of their lives, so it comes as no surprise that your grandparents can wake up each morning and proudly announce they have survived another day. Only a grandparent can make a text like this sound incredibly adorable. 15. They always look amusing, no matter what they’re doing. In terms of impressiveness, grandparents never fail to deliver. You don’t have to wonder how this is so entertaining to watch. For some reason, they are extremely cute no matter what they happen to be doing. 16. They know they can do anything. Who says you can’t teach an old dog new tricks? Contrary to popular belief, grandparents don’t have much of an issue with getting down with the youngsters. Grandparents have that uncanny ability to ruin something that was supposed to be completely ‘cool’ or ‘hip’. But we love them for it anyway, and it’s kind of cute if you think about it. 18. They might be more reckless than you. Never assume your grandparents are boring. As far as you know, they could be so far above you on the awesome scale. 19. They have no idea how adorable they are. 20. They know how to have fun. What do your grandparents do while you aren’t around? They tear it up of course! Who says only young people have fun? 21. They are NOT boring. Would you call yourself reckless? Chances are your grandparents can beat you in that department. Who has time for being old? 22. They ruin the joke without knowing. It was only meant to be a joke, but that’s okay, it’s only cute when you do it. Grandparents have the skill of ruining the joke without annoying anyone. 23. They make video chats unforgettable. Who doesn’t love seeing these ridiculous faces in video chats? I bet these are the most unforgettable Skype moments of your life. 24. They know your favorite references. When grandparents understand those favorite references, it just makes you love them even more. 25. They can never be bored. Grandparents have the most fun of all. They have lived their working lives to the max, and now they just get to chill out and do whatever they want, including this. 26. They prefer to remain old school. Some grandparents decide that moving with the changing times is boring. They like to stick to the old school methods. 27. They use technology like its 1999. You know all that expensive electronic equipment you would kill for? Well your grandparents have it and all they use them for is Solitaire. They’re not stupid, they just know exactly what they want from technology, and it’s not Facebook. 28. They do what they want, regardless of what people think. 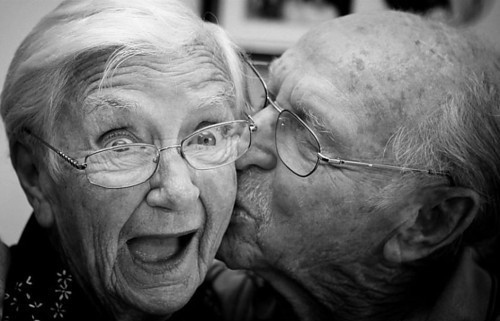 Your grandparents have been around awhile and they know what really matters in life. They can pull the silliest antics in public and know that it doesn’t matter what other people say. 29. They know what’s important. Who says you can’t live without social media? Your grandparents, in most cases. At least they know what’s really important, and it’s adorable. 30. They can be the life of the party. Who cares about joint pain and social stigma? Grandparents love to let loose and when they do, it is the most adorable and amazing thing you will ever experience in your life.